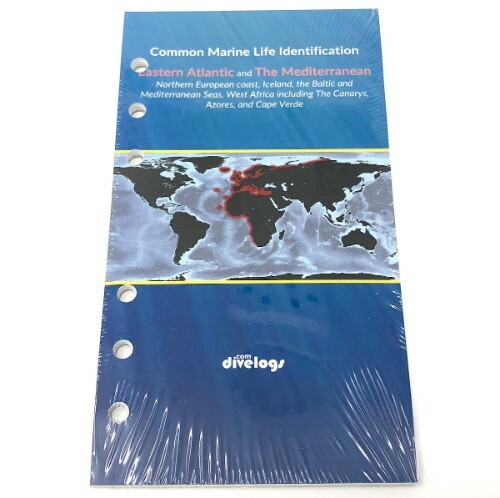 DiveLogs - Fish ID Log Pages - Eastern Atlantic and Mediterranean. 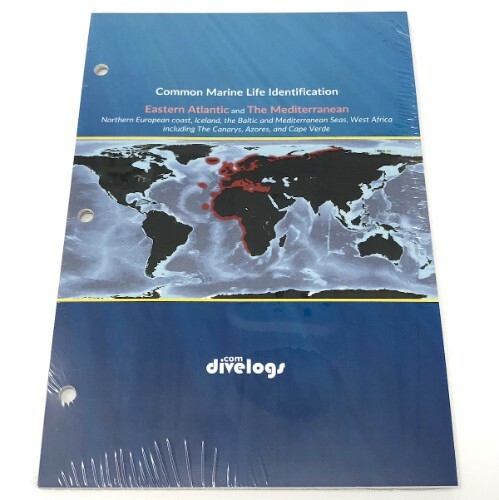 These are the 3-ring dive log version of the Eastern Atlantic and Mediterranean fish id log pages. Because of the wider page, they have more space to record your notes and sightings. 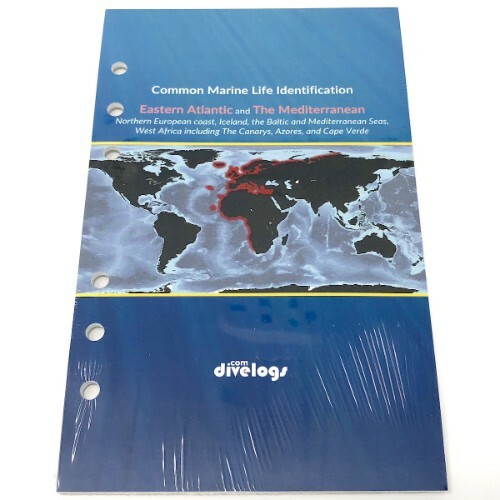 Our 6-ring compact dive log binder version. 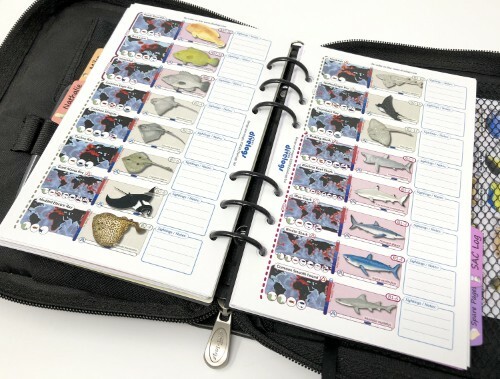 These are compact but still have space on the side for your notes and sightings. The filofax version of the fish id pages has a special version and placement of the sightings box to create the best balance between the species information and your notes. 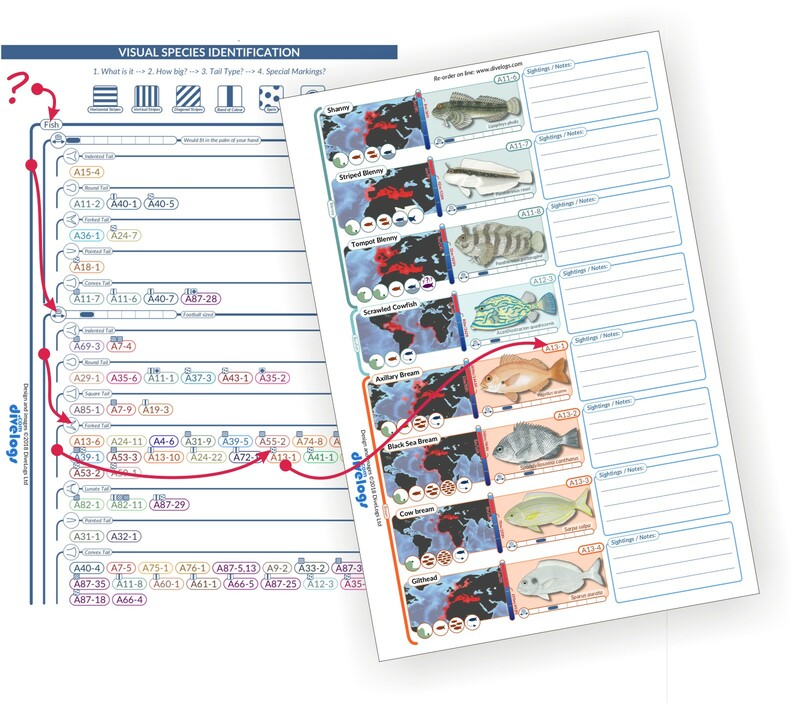 Each Fish ID log Page set comes with it's own visual index pages. Use the simple things you see underwater about the species to help you quickly identify it. This fish id collection covers Iceland, Norther European waters, the Baltic and Mediterranean Seas, The Azores, Canarys, and Cape Verde, and western atlantic waters. 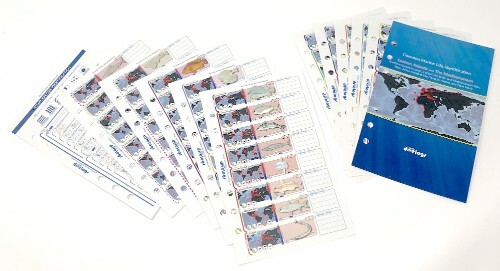 The set contains 160 of the most common species for the atlantic and mediterranean, printed onto glossy card. Use the visual species identification chart to narrow down species to look at when trying to identify. 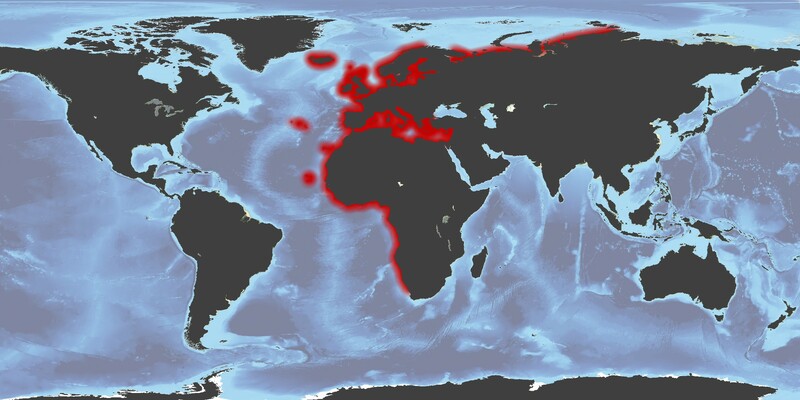 This is a subset of common marine life you should expect to see in the Eastern Atlantic and Mediterranean. It covers Iceland, Northern European waters and the Baltic Sea. Then continues on around the western edge of Africa, including the Azores, Canary Islands, and Cape Verde. Also included is the Mediterranean Sea. The set includes details for 160 different species, including fish, sharks and rays, marine mammals, reptiles, crustaceans, and marine invertibrates. As well as fish id information at your fingertips, each species listing has an integrated sightings and notes section right alongside. Use this for any special notes or direct reference back to that special dive where you had that special fish encounter. We print these on a special glossy card to really make the images pop and the details pin sharp. 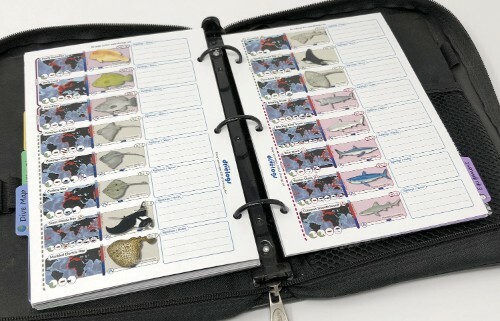 The set contains 28 pages (14 sheets) for the 3-ring binder and DiveLogs compact binder size. 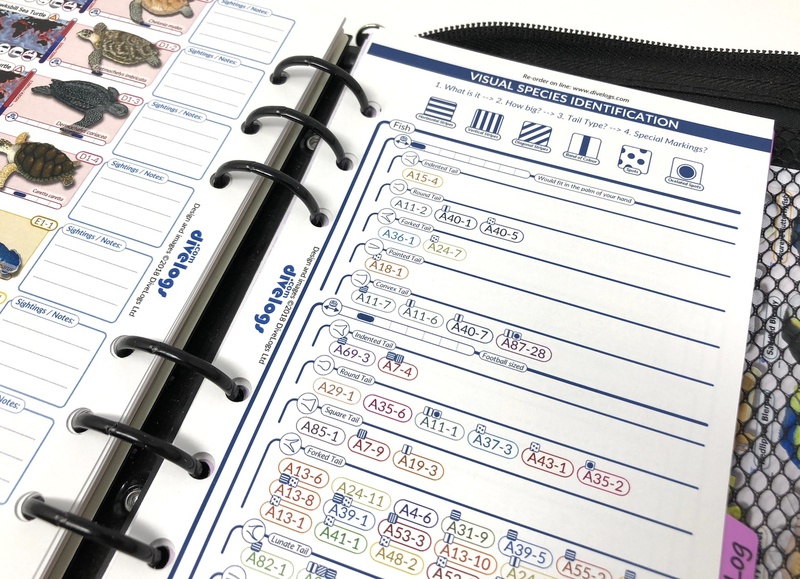 For the personal organiser size, this increases to 40 pages (20 sheets) to ensure the information is present at a useful size. 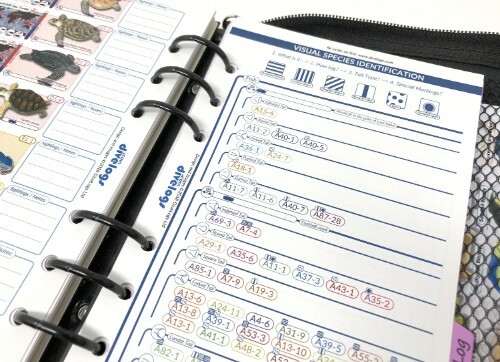 For all the information included, the set is still a compact thickness so will fit well within your dive log binder. 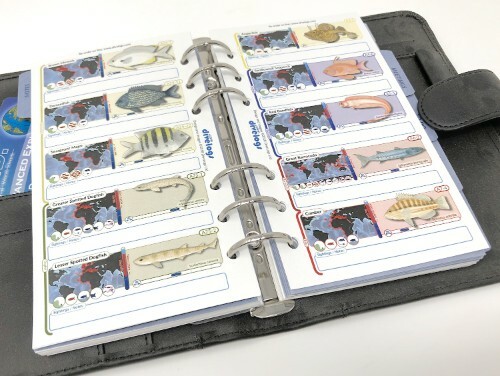 It has never been easier to take fish identification information with you when you are travelling or need a spontaneous quick reference. Please visit this page: Info on page sizes for more details on page dimensions etc. We also have a fully waterproof version that you can take on your next dive! Also included is our specially developed visual identification index. Using just a few simple cues such as species type (fish, reptile, shark etc. ), the size, and the tail type, you can quickly narrow down the list of species it could be. Adding in any special markings such as stripes, bands of colour or spots etc, can narrow it down further. You can see this in one of the product images above. 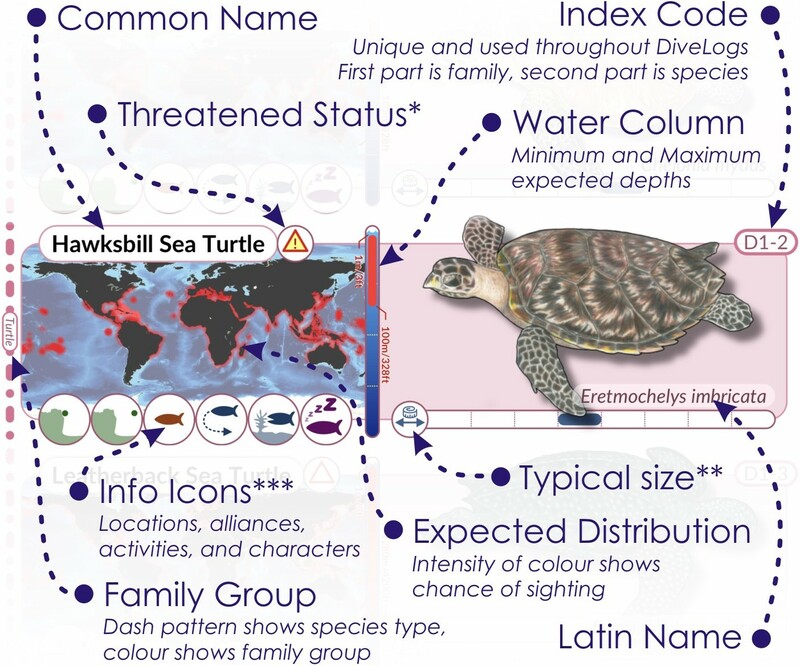 Each species listing is packed full of usefull information such as distribution maps, water columns showing typical depths, size gauges, and info icons. The info icons are arranged in four types. Locations, Alliances, Activities, and Characters. Locations show you where you should expect to find the species, alliances indicate whether they are solitary or they form pairs or groups or schools, activities highlights what they typically get up to, and characters shows you any special behaviours you should look out for.